Roasting vegetables in the oven makes simple work of a pasta sauce. The vegetables soften nicely and sweeten while they cook. No need to constantly stir as you would with stove top cooking. You can use whatever vegetables you would like, however, I would recommend you use plenty of garlic. Put the olive oil in a roasting pan and place it in the oven for a few minutes until you heat activity. 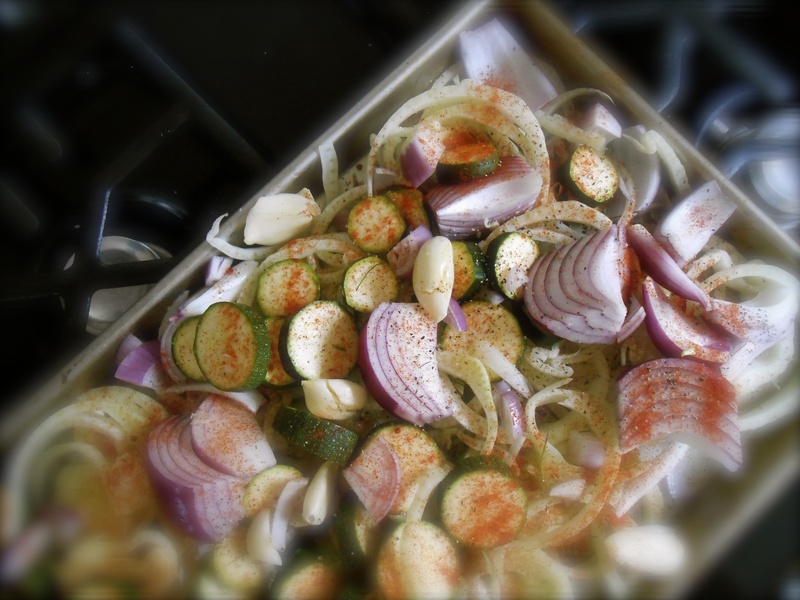 Add all the vegetables and the garlic to the hot roasting pan and sprinkle over the paprika. Season with salt and pepper. Roast for approximate 20 minutes, giving the pan a shake now and again. Continue roasting until vegetables are soft, roasted and slightly browned. Add the tomatoes and olives and stir to coat well, roast additional 5 minutes. Remove from oven, cover with foil and let sit while you cook the fettuccine. Cook the fettuccine according to the package instructions, typically 9 – 11 minutes. Drain well and return to the warm pot. Add the butter and toss well. Add the roasted vegetables and toss gently to combine everything. Sprinkle with grated Manchego and serve right away. Fennel is one of my favorites. Lovely pasta. Thank you. Roasted fennel is one of my favorites too. 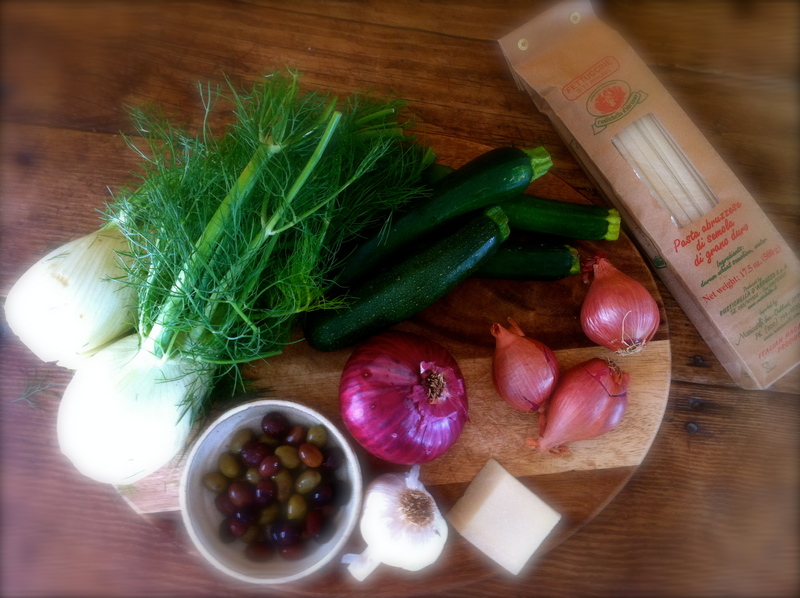 I’ve never tried cooking with fennel…much less eating it with pasta! so… maybe I’ll try it one day! And… totally agree with you on “plenty of garlic”! It’s one of those things my life would be incomplete without..thanks for sharing dear! have a great day! Yes! You should try it. I really love roasted fennel. Hope you are having a good week. This looks wonderful. So many of my favorite foods all in one dish! Especially the garlic. You know…we have very mild summers here in Seattle. Last year I think our highest temperature was something like 85°. And that only lasted two or three days. Most people do not even own an AC! Your taste in Cheeses is extraordinary!!! Roasting would really make those vegetables come alive. Using them to build a pasta dish is my kind of meal — and the possibilities are endless. I agree. It is so true. So many vegetables are wonderful roasted. This was a pretty good combination. Love fennel. This dish looks so~ appetizing! Roasted vegies, YUM! I’ve yet to roast anything for pasta! Can’t quite believe that. I always stay with food on the hob or stove top. Well, I tend to listen out for what is cooking. I’m usually online in another room. That aside, I must roast some veg as well the next time I’m baking bread. That way I’ll have sups almost done. Only pasta to cook. And I agree, always lots of garlic! Awww. And perhaps I must bake some bread next time I’m roasting vegetables! Bread baking is my biggest failure. I mustn’t give up though right! Sweet breads…easy. Breads which require a rise…no so easy for me. I LOVE oven roasted vegetables! And this dish this looks just wonderful – especially like the photograph of the baking tray of vegetables – so enticing. Oh this is wonderful, roasting the vegetables makes for a very tasty sauce for the pasta. This looks fantastic. I absolutely LOVE fennel and have not yet tried it in a pasta dish. Great idea, and it looks wonderful! Love your combination of ingredients…this sounds like a delicious dish. Your website is so clean and organized and the photos are wonderful!!! Have a pleasant day! Oooh, so loaded with veggie goodness! So many colours and flavours…I could imagine this being a hit at a summer picnic. I’d only recently started cooking with fennel, and it adds such an interesting depth to dishes. 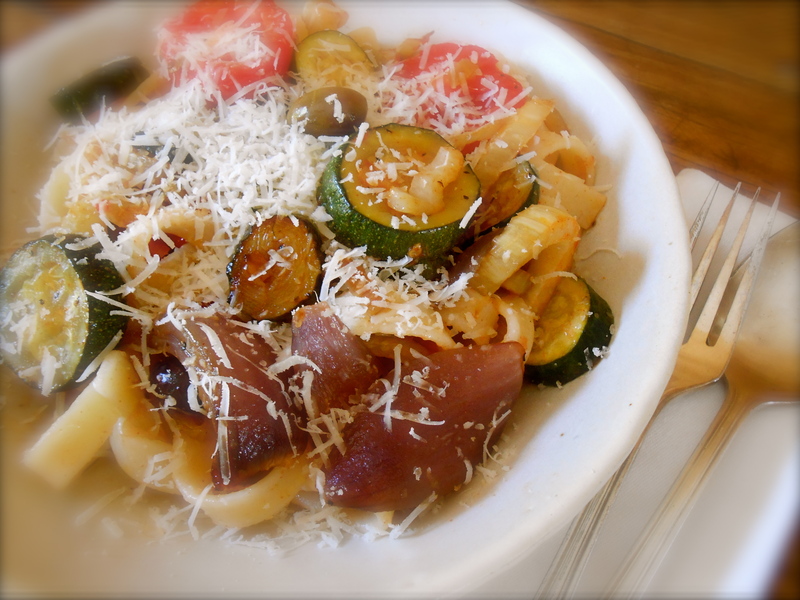 This is a great way of incorporating veggies in a pasta dish. Love roasting veggies. Looks heavenly! Glad to see you have a love for fennel too! It’s one of those under appreciated vegetables. Thanks for the idea of roasting veggies with smoked paprika. Sounds really good. You are currently reading fettuccine with roast fennel, zucchini and olive at COTTAGE GROVE HOUSE.